It’s not just kids who are in “danger”, apparently members of the Thai clergy are getting on board as well. The internet craze ‘planking’ has found its way to Thailand, but it has come with a warning from authorities. Thailand’s Mental Health Department has advised parents to supervise their children when ‘planking’, warning that the fad could be dangerous. Director general of the Mental Health Department, Doctor Apichai Mongkol, issued the comments about the fad, which sees participants lie face down with both hands touching the the side of their body, usually in unusual locations, and then post the images on the web. He advised that parents should supervise their children because it could be dangerous doing ‘planking’. He added that children must be told to ‘plank’ at only appropriate places so they would not cause trouble to others. But it’s not just kids who are in danger apparently. Phra Phrommolee, a senior monk in the Sangha Supreme Council, yesterday urged leading monks to prevent more Buddhist clergy from indulging in the craze. “Although there’s no rule specifically against such activity, it’s not an appropriate thing for monks or novice monks to do,” he said. 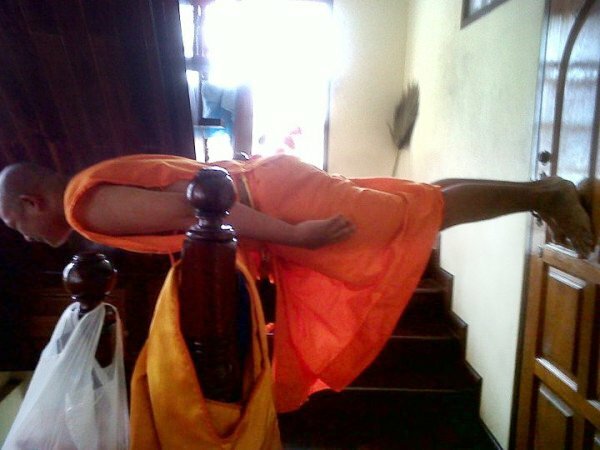 The comments came after photos of a someone dressed as a Thai monk ‘planking’ spread across the internet. Mr Apichai believes that the craze will soon fade away though, especially if it is frowned upon by the society. Of course, how likely it is to be frowned upon is the key question in that conclusion, as it grows increasingly popular with Thai celebrities and entertainers.